Here’s a recipe that’s an oldie but a goodie for making a quick homemade cookie. 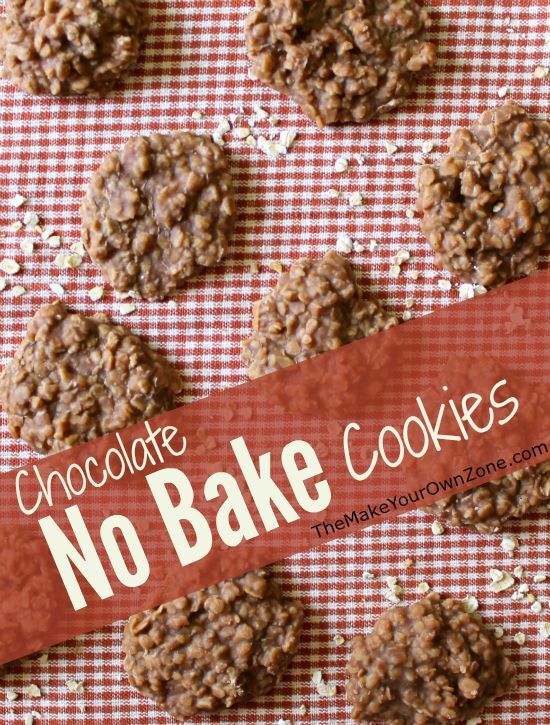 I’ve had this recipe for Chocolate No Bake Cookies in my recipe box for a loooong time. In fact I remember when I clipped this recipe out of a newspaper years ago it was titled “Everybody’s Favorite Chocolate No Bake Cookies”. And that’s because not only are they tasty, but they go together quick and easy too. You stir together some melted butter, sugar, milk, and cocoa powder in a saucepan on the stove. Once it boils, you take it off from the heat, stir in some peanut butter, vanilla, and oats. And that’s about it! The only thing left to do after that is to drop the mixture by spoonfuls onto wax paper and let it cool. This recipe is perfect for summer time too. You get the goodness of a homemade cookie with no need to heat up the stove on a hot day. 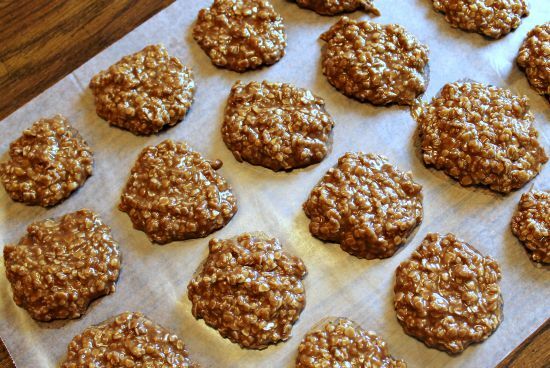 A final bonus – because this recipe has no flour in it and just uses oatmeal instead, it could be a good recipe for those with gluten sensitivities. 1. Melt the butter in a saucepan over low heat. 2. Add the cocoa powder, sugar, and milk and stir to combine. 3. Continue to heat until mixture comes to a boil. Boil for one minute longer, stirring constantly. Then remove from heat. 4. Stir in the peanut butter and vanilla. 5. Finally, add the oats and mix well. 6. Drop by spoonfuls onto waxed paper and let cool. These are what my Mom made that we really loved. She always put raisins in there too, and or some mini marshmallows if there were some at home. I have a bake sale next weekend….. I think I'll just have to make these..Saucepan sale! Ha. I have never tried marshmallow creme, but I bet it would work. It would probably result in a cookie that was more like a rice krispie bar. I did try substituting Splenda for the sugar one time, and that did not work very well. The cookies wouldn't harden up right. So if the marshmallow creme doesn't work, it would probably be the same kind of problem – an issue with the cookies hardening up. If you try it, come back and let us know how it went 🙂 Would love to hear your experience! Love your website, instead of Peanut Butter can marshmallow creme be used? Laura – thanks for the link. Good article, but scary too! I've had a couple occasions where I've eaten popcorn from a movie theater or a concession stand and my heart has started racing. I've wondered if it was the yellow dye in the buttery stuff they put on it. I guess this is another good reason to make our own stuff! Avoiding artificial food coloring can also help with ADD and other behavioral issues. My daughter has meltdowns from it, but some kids just get wound up or have trouble concentrating and some are not affected at all. Still others have allergic-type reactions like hives and breathing problems– freaky stuff! My mother and I always made this cookies when I was a child. So I have always made them. My husband and I have them when we feel like having candy because they are almost like candy bars. I love how easy they are! The milk does help keep these cookies moist. I saw another version of this recipe with more cocoa powder and gave it a try but did not like it as well. I went back to my usual way of doing it which seems to be a pretty good combo of ingredients.